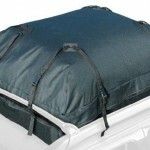 Car roof bags can often be folded and stored in smaller spaces than hard shell carriers, and are sometimes cheaper as well. There are advantages and disadvantages when comparing both hard shell car top carriers and car roof bags. Read our reviews to learn more about each type that we cover. For the best weather-proofing, security and ease-of-use, we recommend hard shell car top carriers – but these car roof bags can be very useful as well. Read our car roof bag reviews to see the positives and negatives of the best car roof bags – you should be able to determine which will work best for you after soaking up all the details we have covered. Review: Highland 10396 Car Roof Bag & Rainproof Cover- The Highland 10396 Car Roof Bag & Rainproof Cover will add to your comfort and convenience while travelling. The duffel bag was designed with inline skate wheels to make it wonderfully portable. It also comes with a protective cover that keeps dirt and road grime away. Review: Sherpak Go! 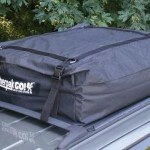 15 Car Top Cargo Bag- The Sherpak Go! 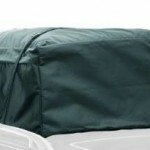 15 Cartop Storage has a weatherproof design and is made of heavy-duty materials. It boasts of radio-frequency-welded seams for reliable protection. 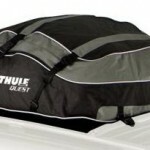 This bag also attaches easily on top of your car, with or without a roof rack. A deeply recessed zipper and heavy-duty UV-resistant vinyl construction keep away extreme heat and moisture. 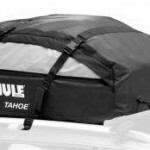 Review: Thule 867 Tahoe Rooftop Cargo Bag- The Thule 867 Tahoe Rooftop Cargo Bag easily mounts to your factory-installed or aftermarket luggage rack and it can give you 15 to 17 cubic feet of extra storage space. This bag is made of water-resistant material and seams are securely taped for ample protection from the weather elements. Review: Lund 601016 Soft Pack Roof Top Bag- The Lund 601016 Soft Pack Roof Top Bag easily attaches to your vehicle’s roof rack. Web straps attach quickly, eliminating the need for drilling. The bag is made of water-repellent nylon and polyester to help keep out moisture. The full-length 2-way zippers allow easy access to your cargo. 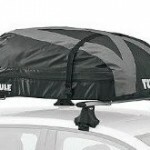 Looking for a hard shell car top carrier? 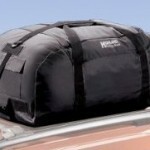 Check out our car top carrier reviews for more options than the roof bags we cover on this page.